This antibody recognizes the mature receptor at the amino terminus (aa 76-93), in the region of the receptor that binds C1q. It will block the C1q/gC1q-R interaction. 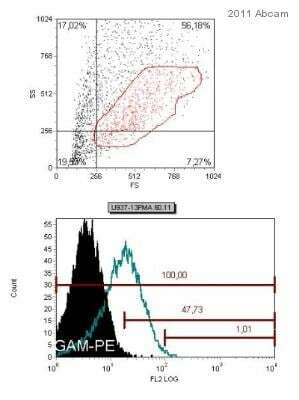 Bacterial expressed recombinant full length protein GC1q R.
This antibody gave a positive signal in Human tonsil tissue sections. This antibody gave a positive signal in the following Methanol fixed cell lines: HeLa. Our Abpromise guarantee covers the use of ab24733 in the following tested applications. WB Use a concentration of 5 µg/ml. Detects a band of approximately 33 kDa (predicted molecular weight: 33 kDa). Binds to the globular "heads" of C1Q thus inhibiting C1 activation. Belongs to the MAM33 family. Mitochondrion matrix. Nucleus. Might also be nuclear in some cell types. Additional bands at: 68 kDa. We are unsure as to the identity of these extra bands. The blot was blocked with 5% milk for 1 hour at 25°C prior to incubating with the primary antibody for 13 hours at 4°C. Flow Cytometry - Anti-GC1q R antibody [60.11] (ab24733)Image courtesy of David Sanchez Martin by Abreview. ab24733 used in Flow Cytometry. U937 cells were cultured in RPMI 10% FCS, treated with PMA (5nM) and, 6-12 hours later, cells were harvested, spinned and resuspended to 200,000 cells in 100µl. ab24733 used at 10µg/ml for 30 minutes at 4°C. 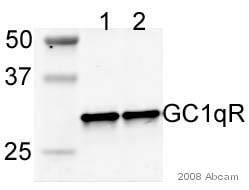 A phycoerythrin conjugated goat anti-mouse polyclonal was used as the secondary antibody at a 1/100 dilution. Overlay histogram showing HeLa cells stained with ab24733 (red line). The cells were fixed with 80% methanol (5 min) and then permeabilized with 0.1% PBS-Triton X-100 for 15 min. The cells were then incubated in 1x PBS / 10% normal goat serum to block non-specific protein-protein interactions followed by the antibody (ab24733, 0.5μg/1x106 cells) for 30 min at 22°C. The secondary antibody used was Alexa Fluor® 488 goat anti-mouse IgG (H&L) (ab150117) at 1/4000 dilution for 30 min at 22°C. Isotype control antibody (black line) was mouse IgG1 [15-6E10A7] (ab170190, 0.5μg/1x106 cells) used under the same conditions. Unlabelled sample (blue line) was also used as a control. This antibody gave a positive signal in HeLa cells fixed with 4% paraformaldehyde (10 min)/permeabilized with 0.1% PBS-Triton X-100 for 15 min used under the same conditions. IHC image of ab24733 staining in human tonsil formalin fixed paraffin embedded tissue section, performed on a Leica BondTM system using the standard protocol F. The section was pre-treated using heat mediated antigen retrieval with sodium citrate buffer (pH6, epitope retrieval solution 1) for 20 mins. The section was then incubated with ab24733, 10µg/ml, for 15 mins at room temperature and detected using an HRP conjugated compact polymer system. DAB was used as the chromogen. The section was then counterstained with haematoxylin and mounted with DPX. ICC/IF image of ab24733 stained HeLa cells. The cells were 100% methanol fixed (5 min) and then incubated in 1%BSA / 10% normal goat serum / 0.3M glycine in 0.1% PBS-Tween for 1h to permeabilise the cells and block non-specific protein-protein interactions. The cells were then incubated with the antibody ab24733 at 5µg/ml overnight at +4°C. The secondary antibody (green) was DyLight® 488 goat anti- mouse (ab96879) IgG (H+L) used at a 1/1000 dilution for 1h. Alexa Fluor® 594 WGA was used to label plasma membranes (red) at a 1/200 dilution for 1h. DAPI was used to stain the cell nuclei (blue) at a concentration of 1.43µM. As it is suitable for these kinds of assays it is therefore free of sodium azide. I hope this helps. If not please let me know and I will be happy to assist you further. Ich hatte bereits in einem 2. Ansatz eine Antikörper-Konzentration von 5µg/ml eingesetzt, da dass unsere Standardkonzentration bei IPs ist. Zu Ihrem 2. Punkt: Dieser war in meinen Angaben wohl missverständlich dargestellt. Die Inkubation des Antikörpers mit den Beads erfolgte zunächst ohne Lysat, im 2. Ansatz sogar für 4h. Das Ergebnis blieb in beiden Fällen allerdings negativ. Ich habe auf Ihrer Internetseite gesehen, dass es mehrere Antikörper gegen das Produkt gibt. Für einen ist die IP auch mit einer Abbildung bestätigt: ab101267. Vielleicht könnten Sie mir diesen auf Kulanz schicken? Es tut mir leid zu hören, dass unsere Vorschläge in diesem Fall nicht zu einer Verbesserung Ihrer Ergebnisse geführt haben. Ich weiß, dass Sie viel Zeit für diese Experimente verwendet haben, und stelle Ihnen daher gerne den ab101267 Anti-GC1q R antibody als kostenlosen Ersatz aus (vorausgesetzt, das Produkt wurde in den letzten 180 Tagen gekauft). Dafür benötige ich jedoch ihre ursprüngliche Bestellnummer oder das Datum der Bestellung. Antibody noncovalently bound to matrix before incubation with lysate sample? 1. Mir ist aufgefallen, dass die empfohlene Starkonzentration für all unsere anderen Applikationen 5ug/ml beträgt, und dies ist doch ausgesprochen ungewöhnlich, da IP normalerweise eine höhere Konzentration benötigt als z.B. ein WB. Ich vermute daher, dass es sich hier um einen Datenblattfehler handelt, und habe unser Labor zur Rückmeldung kontaktiert. Ich möchte Ihnen daher empfehlen, die Konzentration ebenfalls auf 5 ug/ml zu erhöhen. 2.Um den Antikörpern die Bindung an die Beads zu erleichtern, möchte ich Vorschlagen, erst die Antikörper an die Beads zu koppeln ( Inkubation für 2h), und dann erst mit dem Lysat zu behandeln. Bitte lassen Sie mich wissen, ob ich Ihnen helfen konnte. Wir bieten unseren Kunden gerne einen kostenlosen Ersatz, eine Gutschrift oder eine Erstattung an, wenn das Produkt wie auf dem Datenblatt beschrieben behandelt und innerhalb von 180 Tagen nach Erhalt reklamiert wurde. Zögern Sie nicht, sich wieder bei uns zu melden, falls Sie weitere Fragen haben.